When I first saw the film Ben-Hur in BluRay with its original aspect ratio of 2.76 I’ve thought: “Wow, will I ever be able to see such a big movie with this wonderful aspect ratio in a big cinema?”. Thanks to Mr. Tarantino, ARCADIA Cinema Milan and 01 Distribution (Italian Distributor with Leone Film Group) this dream has come true. 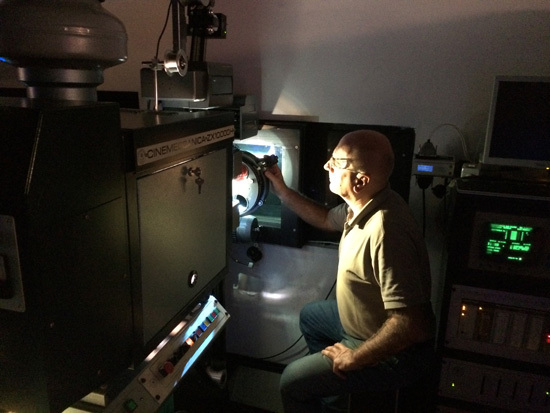 ARCADIA was the first cinema in Italy to book the 70MM print (see ARCADIA’s 70MM background experiences), followed by other two Italian locations, one in Bologna (Cineteca, Film Archive) and one in Rome (non a conventional operating cinema theatre, it’s the Stage 5 within Cinecittà Studios). Thanks to Mr. Tarantino, as everywhere else in the world, the 70MM release in Italy is exclusively one week prior the Digital distribution (due on thursday Feb 4th). 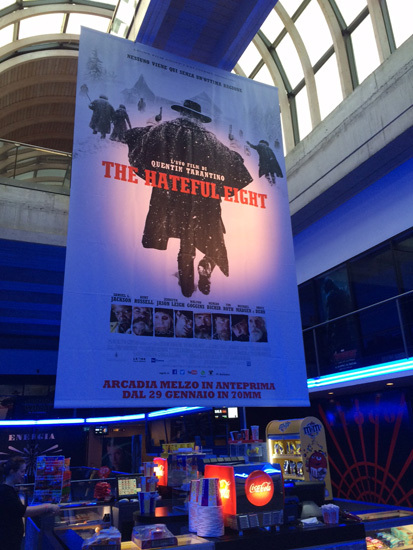 I’ve enjoyed the film in ARCADIA, on huge ENERGY screen on Friday the 29th of January at 5.30pm screening. From the very beginning you could feel this was not a regular experience. 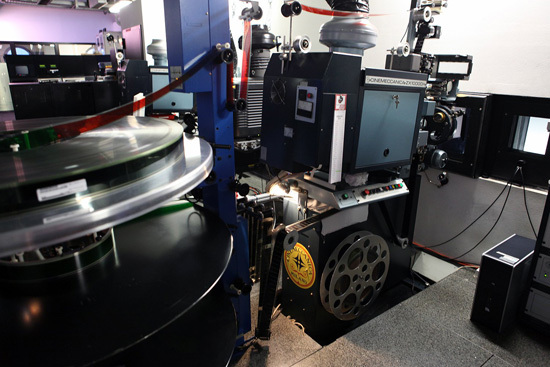 The Programme has been handed out by ushers at ENERGY’S entrance with the genesis of the film and some technical information about the Ultra Panavision 70MM format. ARCADIA’s ENERGY screen was full open in all its glory, 30 x 16 meters….a slide of the film’s title was projected on screen while the audience is entering. After 3 trailers, Laura Fumagalli, daughter of Mr. Piero Fumagalli, ARCADIA’s passionate owner, made a quick introduction, explaining how they are proud to present the film in the special Ultra Panavision 70MM format as Mr. Tarantino meant it to be. She also gave some news about ARCADIA’s recent major technical upgrade. They have just installed a brand new Perlux Screen by Harkness 30 metres wide and they are about to complete what will be the biggest Meyer Sound System – Dolby Atmos configuration in the world. 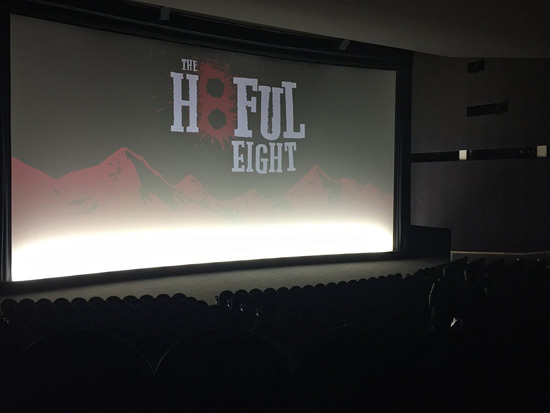 She has advised that The Hateful Eight is in 5.1 audio format but they wanted to give us a taste of the new sound system, not fully finished. So before the beginning of the movie, we have enjoyed a Dolby Atmos demo with the brand new stunning Meyer Sound System. After that, the Musical Overture by our own Italian Maestro Ennio Morricone started and, guys, it was a INDEED A JOY for the eyes and ears! That’s Cinema! The film was wonderful, the projection was perfect, the print was stunning and all the flickering linked with celluloid projection brought the film ALIVE. The wide aspect ratio made the film BIG and UNIQUE, the composition inside the frame kept the claustrophobic sets even more intimate, the definition of the 70MM print had its best in the clothes, you could see every single hair in the fur of the actors and the contrast black and white of the picture were miles away from what we are used to see in digital. 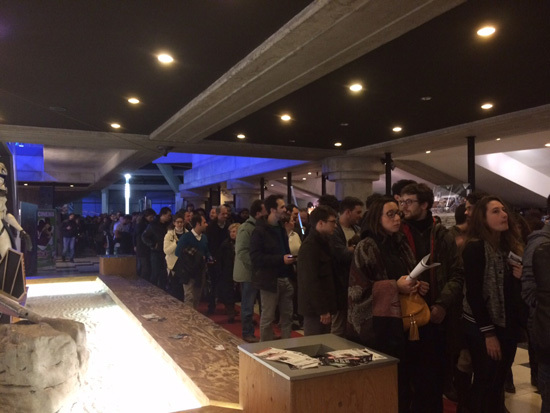 I’ve never seen so many people enthusiast in front of a 70MM film print! 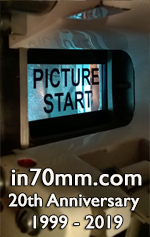 When Interstellar was released in 70MM everybody thought about a miracle that an analog print was back again into theater, but now with The Hateful Eight and next year with Christopher Nolan’s Dunkirk the idea of “cinema experience” is back again. Thank you again Mr. Tarantino, thank you ARCADIA. YOU REALLY SCREEN FOR PEOPLE WHO CARE AND LOVE THE UNIQUE CINEMA EXPERIENCE.